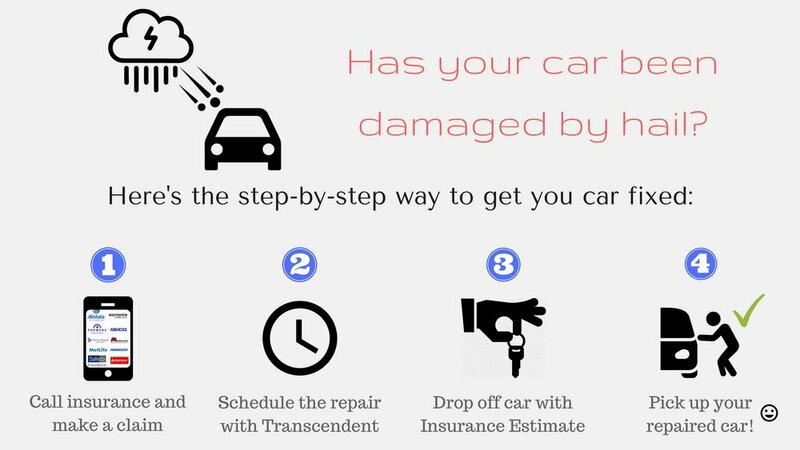 Hail Damage — Transcendent Paintless Dent Removal Inc.
Has your car been damaged by hail damage? We can help! Our highly trained technicians can fix most hail damaged vehicles and restore it to its pre-storm condition. We use an insurance approved matrix system to estimate the damage. It is a per panel charge. Each panel is evaluated to determine the amount and size of dents. Why use Transcendent Paintless in the case of a Hail Catastrophe? We are Certified as PDR Nation Technicians and we are proud members of THE HAIL COMPANY NETWORK (http://www.thehailcompanynetwork.com/) . Being part of this network allows us to help you with any sized Hail Catastrophe. If you need 1 quality technician or 100 top notch technicians, we are prepared!